A huge innovation in a tiny field. 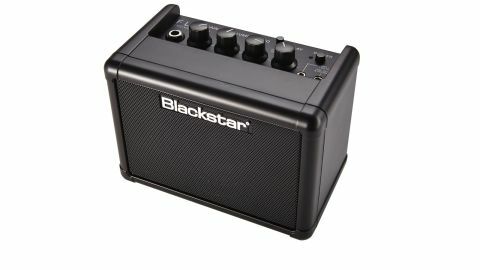 Evolves the micro amp concept. Excellent tones for the size/price. Great value. Built-in delay! Building on the already compact ID:Core series, the Fly 3 takes the micro amp concept and runs with it, packing three watts, two channels, digital tape delay and Blackstar's Infinite Shape Feature for British and American sounds. "It's the tone that makes the Fly 3 such a resounding success"
What's more, you can even buy an extension cab (£19.99) to create a stereo rig, which works brilliantly for playing tunes via the 3.5mm audio-in jack. It's the tone that makes the Fly 3 such a resounding success, though; it sounds as good as practice amps four times the size, with a meaty bass response, American-style cleans and hefty gain. Dialling in a touch of tape delay helps to enhance the size of the sound, too.